The Economic Coordination Committee (ECC) has accorded the approval of the new foreign policy on the import of the cars and the sender can pay the amount in the foreign currency. Permission to Pay Import Duty in Foreign Currency. The federal government declared the new SRO 52 (1) 2019 with the amendment in the import policy after the trade deficit in the country. 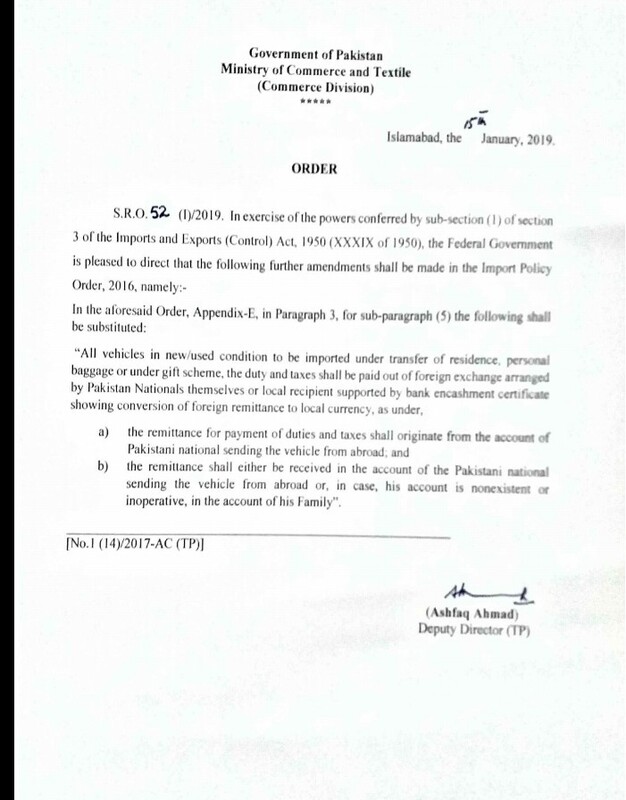 The users will have to pay the duty and taxes on all imported vehicles on used and new vehicles, under the persona baggage, gift scheme or transfer of residence, which will be paid out of foreign exchange, which can be arranged by Pakistani nationals or local recipient to show the conversion of foreign remittance to local currency through the encashment certificate of the bank. The above mentioned schemes were misused by dealers previously, who imported the cars for commercial purposes. The amendments can be positive news for the coming and current automakers as the auto sales in country are on consistent decline. The new SRO 52, the SRO 1067 was issued in October 2017 and after the release of this SRO, it was considered by many local car importers that government put ban on the import of used car in the country. The government rebutted argument and asserted that SRO was issued to reduce trade deficit and stop the misuse of import car schemes like gift, baggage and transfer of residence, which can give relief to overseas Pakistanis and they were not provided to serve the commercial purposes. Personal Baggage Scheme and Transfer of Residence: Under the provision of baggage and transfer of residence schemes, non-resident Pakistanis can bring cars in the country. It is important to mention that people, importing the cars, think that vehicles are welcomed through these schemes as the duty free cars. Gift Scheme: The non-resident Pakistani can gift the car to any person, who live in Pakistan under this scheme.